Janet A. Rudolph is known as "The Mistress of Mystery." She is the writer/producer for Murder on the Menu®, director of Mystery Readers International, editor of the Mystery Readers Journal, a teacher of mystery fiction, and has been a columnist for most of the mystery periodicals. She is a member of Mystery Writers of America, the International Association of Crime Writers, the British Crime Writers Association, Sisters in Crime, and the American Crime Writers League. She has been on panels at Bouchercon (the World Mystery Convention), Left Coast Crime, and several other mystery conventions. 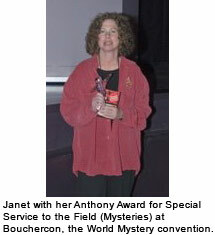 Janet was Fan Guest of Honor at Malice Domestic in Washington, D.C., and an invited participant in international writing conferences in Spain, England, and Cuba. She blogs at Mystery Fanfare and Dying for Chocolate. After spending her first 22 years in Philadelphia, PA, where she received her B.A. 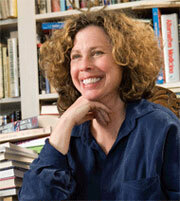 from the University of Pennsylvania, she moved to Berkeley, California, where she completed a master's degree in art history, a credential in secondary education, and a Ph.D. in religion and literature specializing in mystery fiction. She has received two Fulbright grants -- one to India and another to Brazil. A world traveler, she now resides in Berkeley, California. The Mystery Readers Journal, her brainchild, is the official publication of Mystery Readers International. Originally started as a newsletter to update the local mystery community on fun events, it is now one of the most important periodicals in the field. A quarterly, each issue focuses on a specific theme with major articles, author essays, special columns and a calendar of events. Members of MRI award the coveted Macavity for excellence in mystery writing. Murder on the Menu®, however, is where Janet focuses most of her creative mystery energy. Murder on the Menu, California's #1 mystery event company, is Janet's own interactive theatre company. Janet writes all the customized mystery scripts for her clients, who include corporations, associations, private parties, and fundraising organizations. Each script is customized to reflect the research she does on the company -- its corporate culture, new products, specific jargon, guests, and more. Janet works with clients to create mystery events which not only "hook" guests into a story through characters and dialogue unbelievably close to home, but which allow guests to wrestle with the clues in an unforgettable "fair play" whodunit. Most of her clients are centered in Silicon Valley, but her company, Murder on the Menu, performs all over the world. Janet finds writing theatrical mystery events a challenging and interesting twist on the mystery genre. One might say, Janet A. Rudolph's entire life is a mystery.